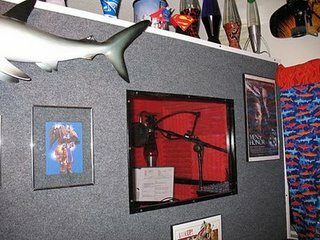 TJ Jones constructed his LavaShark recording studio from a DAWBOX kit - but enlarged the plan to accommodate his 6'3" height - and an inclination to "get animated when I read." I started in radio when I was in the Navy in 1987, at AFAN in McMurdo, Antarctica. I also worked at KZTR in Ventura, KLOS and KLSX in Los Angeles. 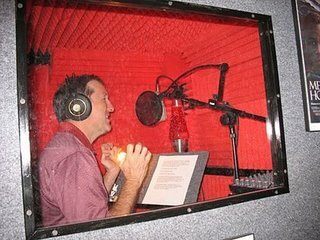 I had also been doing some live auction and emcee work - I am the emcee at the annual Avalon Harbor clean-up dive award ceremony - but hadn't really thought about voice-over until 2007, when the Tournament of Roses decided to add an audio tour of their floats, and my wife recommended me for the job. 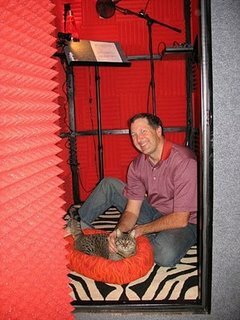 The engineer at that session told me I was pretty good, so I took a couple of classes, and I am currently studying with Pat Fraley in Los Angeles. 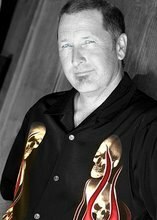 I have gotten gigs with Dale Earnhardt Jr.'s Hammerhead Entertainment, Pool World, Aloha Dive, and have been tapped to once again be the voice of the Tournament of Roses audio tour, and recorded announcements. 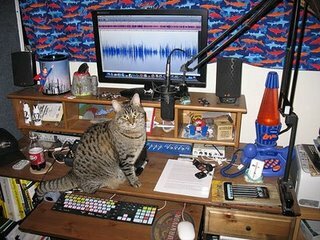 And this led to my desire for a quiet home studio environment. I decided to build my own – ordered plans online from DAWBOX, and set to my task with a vengeance. Following is an illustrated blow-by-hammer blow story of the building of the Lavashark studio - so named after my ridiculous collection of lava lamps (28 to date!). The plans and materials arrived. But the first thing I noticed was the room size of 4'x4'. Now, I'm 6'3" and weigh about 210, plus I get animated when I read. Obviously, I wanted a bigger booth, so I altered the plans to construct a 4’x6’ booth. (And naturally, the company came out with 4'x6' plans while I was building mine!). Next I took off to Home Depot for lumber and assorted goodies, and then headed back to my in-laws’ garage. As luck would have it, my father-in-law is a woodworker, so he has every tool I needed. Besides that, he and my mother-in-law were out of town, so I could knock this project out without inconveniencing them. 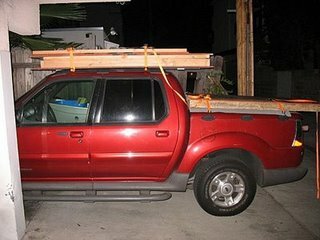 Initially the project looked like a crate. With a nice door. I installed and painted the interior framing, and cut out the window. I had an idea of how I wanted the booth to look, but it was still all just loose thoughts. Yet by this point it started to look more like a room, and less like a piano crate. I strapped the pieces to my truck and moved them to what would be their new home - our spare bedroom … er, sorry - the studio! I got the booth assembled and installed some décor. Left to my own devices, I might have gone crazy with the exterior. But cooler heads with better taste (my wife’s!) prevailed, and I went with the perfection gray that DawBox recommended. Initially I planned to use 1" gray foam on the interior walls, but then got the inspiration for something with a bit more zip. So I ordered custom-cut 2" red pieces! The result was better sound and a much wilder look. I also managed to find zebra-patterned carpet for the floor, in lieu of the recommended workout mat. The plans called for metal end caps, but because I did not care for that look, I just used molding on my corners. My Lavashark studio was fini! I found a “recording” sign on eBay, available in several models and colors. Then George Whittam from ElDorado Recording Services in Los Angeles came out to tune everything up. Now everything sounds great, and my noise floor is -66! If you are in the Los Angeles area, I HIGHLY recommend having George tweak your system to perfection. He is a great engineer and a great guy. 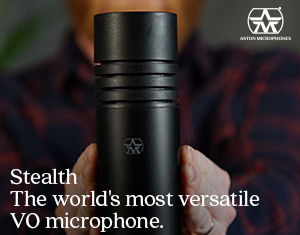 With his expertise you will sound better than you ever have. By the way, my new studio features 18 lava lamps on top, with 11 sharks “swimming” around outside. Equipment-wise, I run a Neumann TLM 103 (with an Audio Technica 4033A as a back-up) into an APHEX 230 master voice channel. I use a Yamaha MG102c board and a Mackie Big Knob studio command system. An MBox 2 and a JK Audio inline patch round out the equipment. At the desk outside the booth, I listen to a pair of Klipsh powered monitors, and in the booth is a pair of AKG K240 headphones. The whole thing runs on a PowerPC G5. I have Pro Tools, but seldom use it these days. 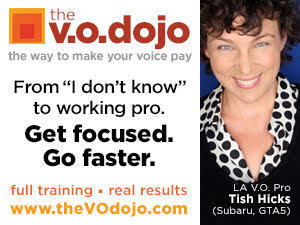 Ever since Beau Weaver talked about Twisted Wave at the Voice 2008 conference, that's the only software I use for voice. Also I found the perfect VO stool for my booth, and added some monitors. The stool is from Guitar Center - a 30" stool with a drum throne style seat, from Sound Percussion. It's perfect for long sessions. The monitors are M-Audio Studiopro 3s, a great, yet inexpensive monitor. They come with an angled stand, which I modified by adding plexiglass hangers to them. Planned updates include a machine cabinet, a Sennheiser 416 (of course! ), a dbx 286a strip, and in-booth monitors. When the cash flow justifies it, I’ll install ISDN, plus a few more lava lamps and sharks! I got to spend six hours in the new booth today. I broke it in right, recording the audio tour for the 2009 Tournament of Roses Parade. Everything worked as intended, though I noticed a few sound leaks to knock out and then be golden. It was a good test, actually, because the neighbors had a crew patching their roof all day, and other than once when the front door was opened, there was no bleed-in. In addition, I will get an LED music stand light, since the existing small halogen light heated up the booth pretty good! Now, was this you-it-yourself project worth it? not been half the fun! 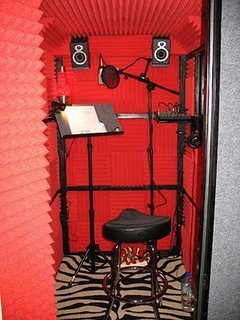 Find All Your Home Studio Equipment ... Conveniently Online ... at the VoiceOverXtra Store! Top Brands ... Low Prices ... Fast Service! Really cool, sound booth! I see DAWbox.com offers a plenum ventilation plan for ventilating the booth, in hindsight do you miss the ventilation or even need it?